Welcome to Ashtabula County. 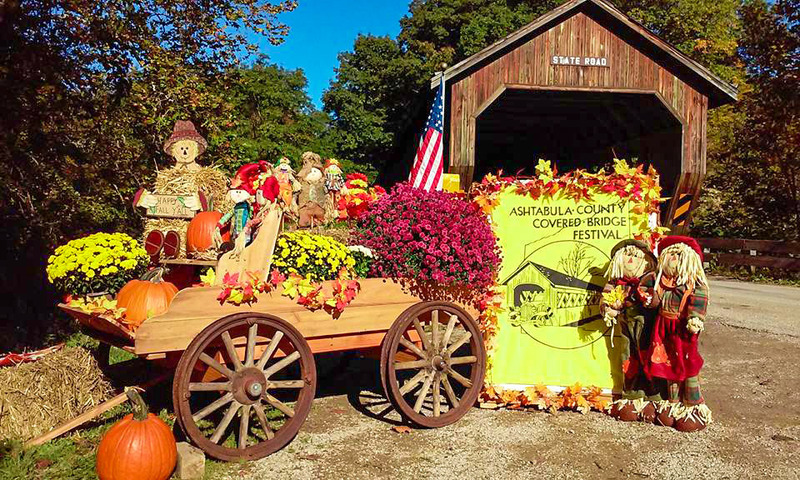 We are glad you have come to see and learn about our Historic Covered Bridges. 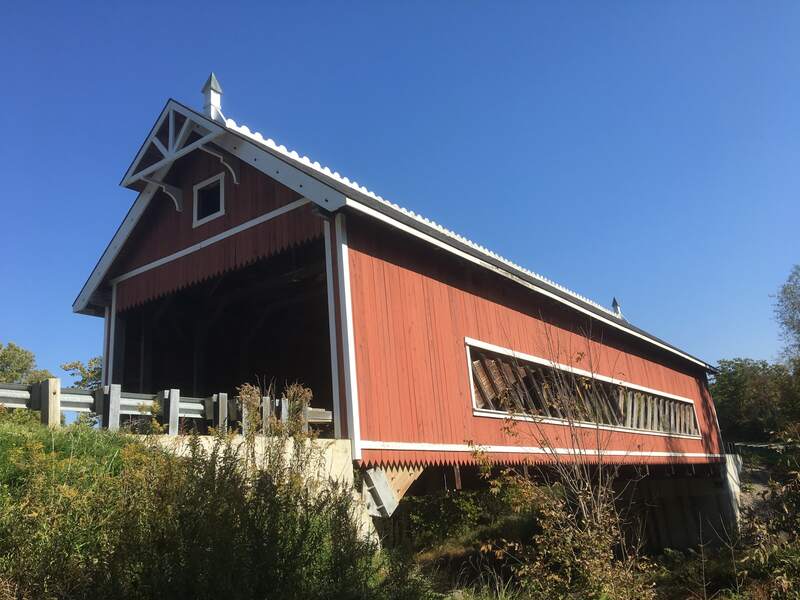 They are of five types: Howe truss, Pratt truss, Town lattice truss, Burr Arch, and Inverted Haupt truss. 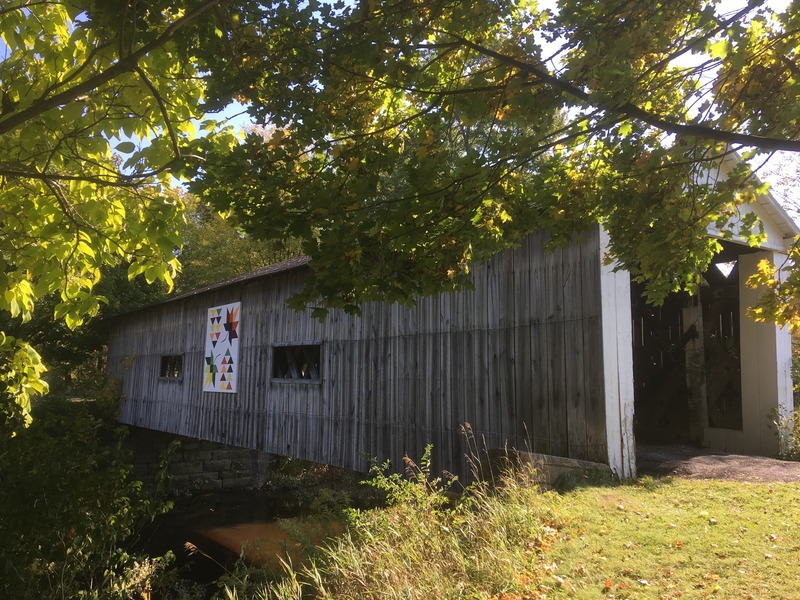 The bridge is constructed over Mill Creek in Jefferson Township, and it features a timber arch with inverted Haupt walls. The Neo Victorian design structure is 110 feet long, 22-feet wide, and 14-feet, six inches high. Construction started in 1998, and it was funded by an ODOT Timber Grant. 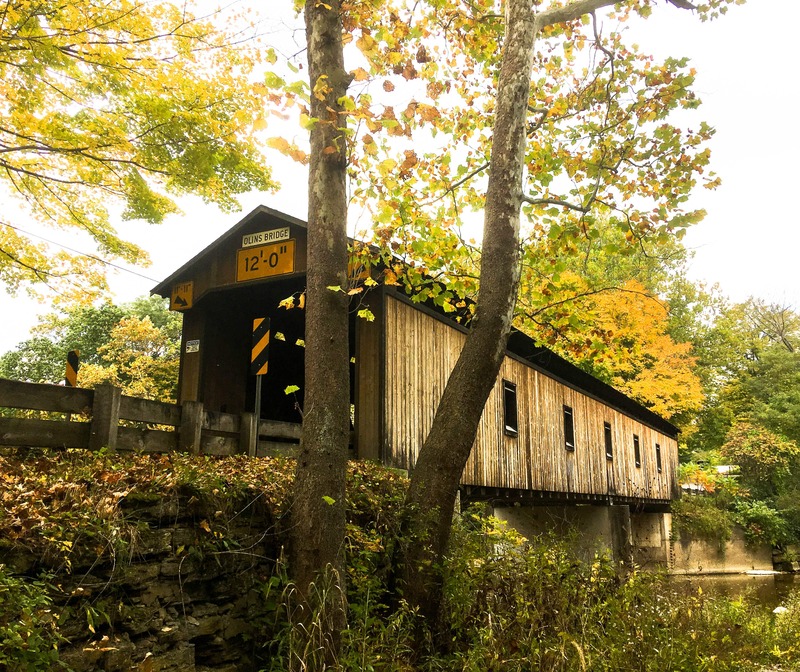 Built in 1890, this Town lattice bridge spans Mill Creek. The 81-foot structure was bypassed in 1975, but is easily accessible. 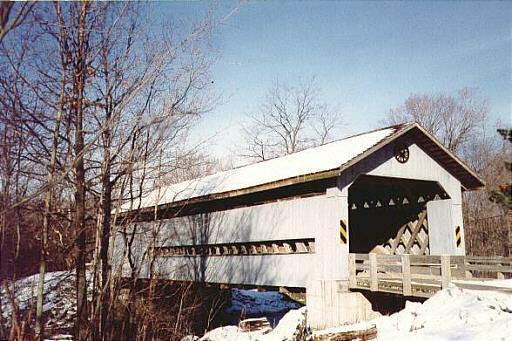 Located on Dewey Road in Plymouth Township, Olin is the bridge named for a family. The Olin's have owned property next to the bridge since it was built in 1873. The 115 foot Town lattice structure over the Ashtabula River was renovated in 1985. 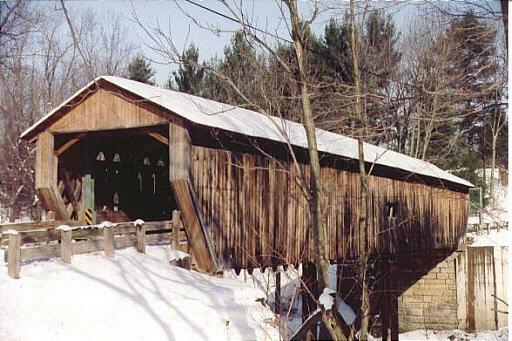 The longest covered bridge in the United States is of Pratt Truss construction. Engineering and structural design by John Smolen (former County Engineer) and architectural design by Timothy Martin (current County Engineer) the bridge was dedicated August 26, 2008. 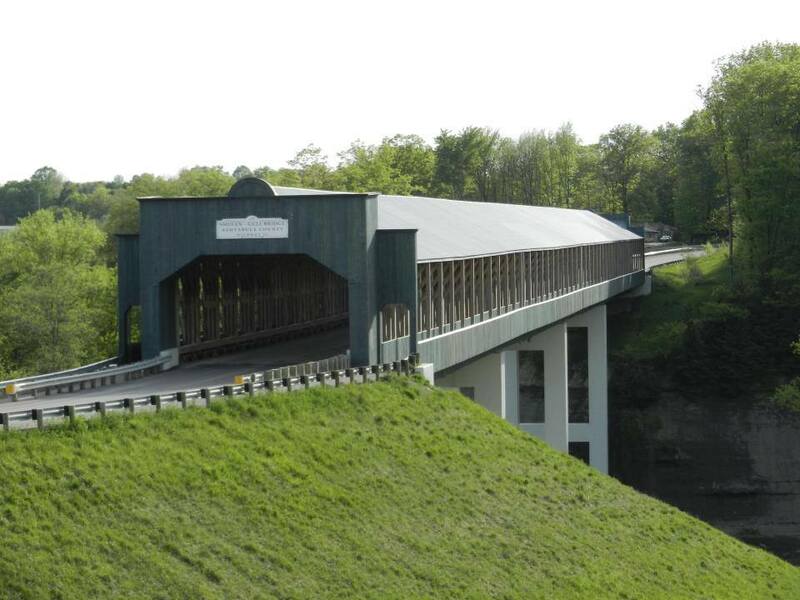 The bridge is 613 ft. long and stands 93 ft. above the Ashtabula River. With clear width of 30 ft. and height of 14 ft. 6 in. it will support full legal load traffic and has a life expectancy of 100 years. The bridge is located on State Road (County Road #25) in Plymouth and Ashtabula Townships and was dedicated on August 26, 2008. 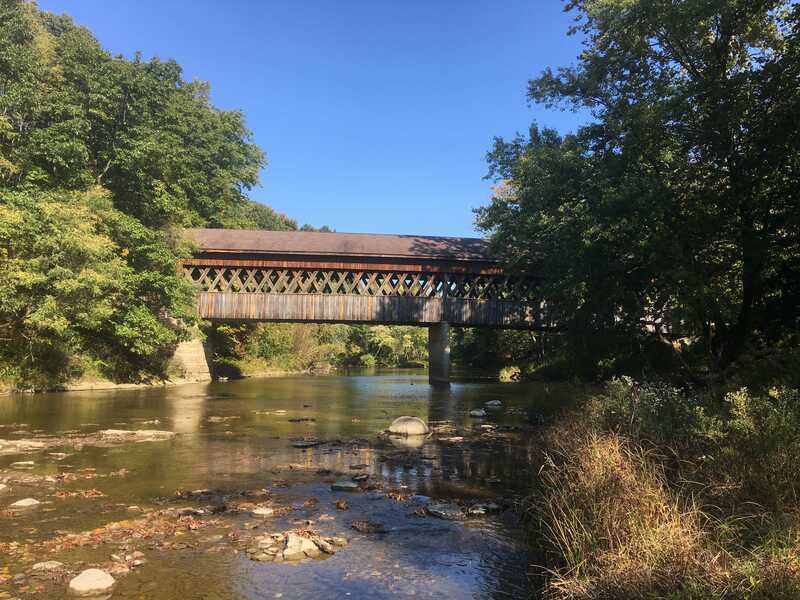 Planning for the project began in 1995 when the annual bridge inspection showed severe deterioration of the existing iron bridge. John Smolen, then the Ashtabula County Engineer, was very concerned about improving the road alignment as well as the replacement of the deficient bridge. Preliminary engineering of the road realignment left a 600 foot gap to be spanned. 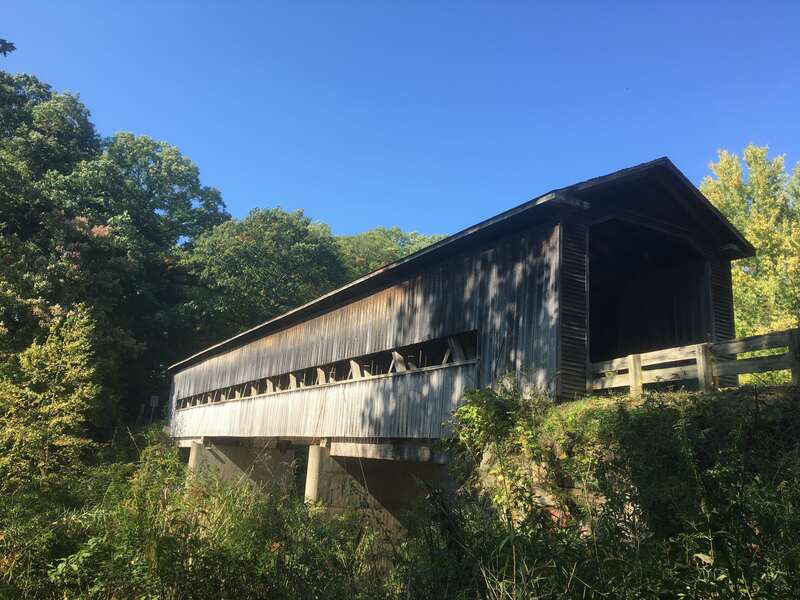 Application was made for Federal funds allocated for bridges and in 2000 the County was awarded the amount of $5 million. From 2001 through 2005 plans and specifications were developed, environmental studies and documents were prepared, additional road rights-of-way were secured, and wetland mitigation was completed. The Environmental Protection Agency and the U.S. Army Corps of Engineer permits were obtained. Construction began mid-summer of 2006 with land clearing and earthen work. From August 2006 to July 2007, 171,000 cubic yards of earth were moved into place to provide the roadway to the new structure. The bridge piers and abutments comprised 7,000,000 pounds of concrete and nearly on-half million pounds of steel were used for reinforcement. 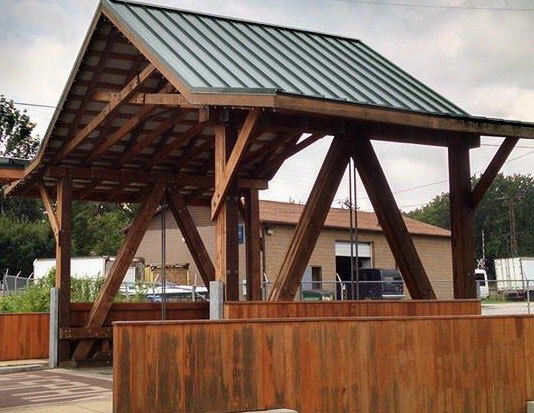 The timber structure used 51,000 cubic feet of lumber or 613,000 board feet. This was enough wood to cover an entire football field to a thickness of 13 inches. Ashtabula County Highway Department crews constructed the block retaining wall, performed seeding and mulching, and installed storm drainage and various other construction components. The bridge is of Pratt Truss construction. The stain used on the bridge is called Olympus Green. There is a five foot wide covered walkway on each side of the bridge. 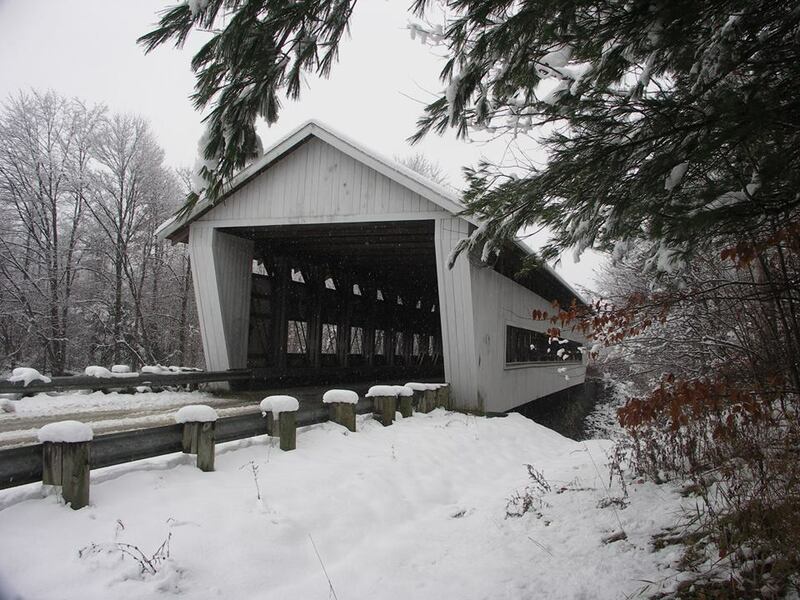 The bridge is the longest covered bridge in the United States at 613 feet. It boasts a clear width of 30’ and a clear height of 14’6”. 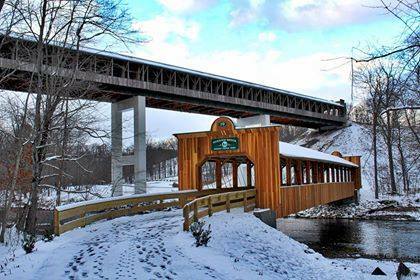 It stands 93’ above the Ashtabula River. The bridge will support full legal loads, including 80,000 pound tractor-trailer traffic and has a life expectancy of over 100 years. The engineering and structural design was performed by John Smolen, former County Engineer and the architectural design was done by Timothy Martin, current Ashtabula County Engineer. You can watch a Youtube video of the construction. 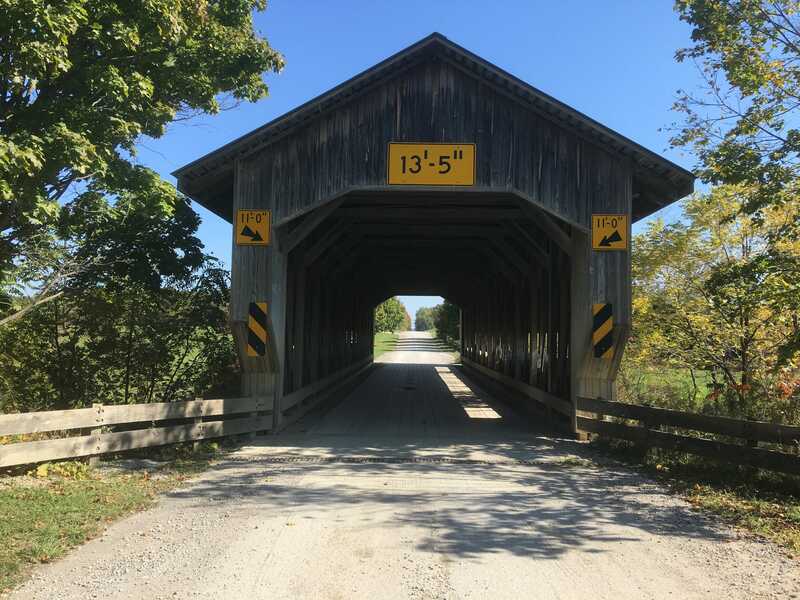 The new pedestrian covered bridge is 150 feet long and 14 feet wide. 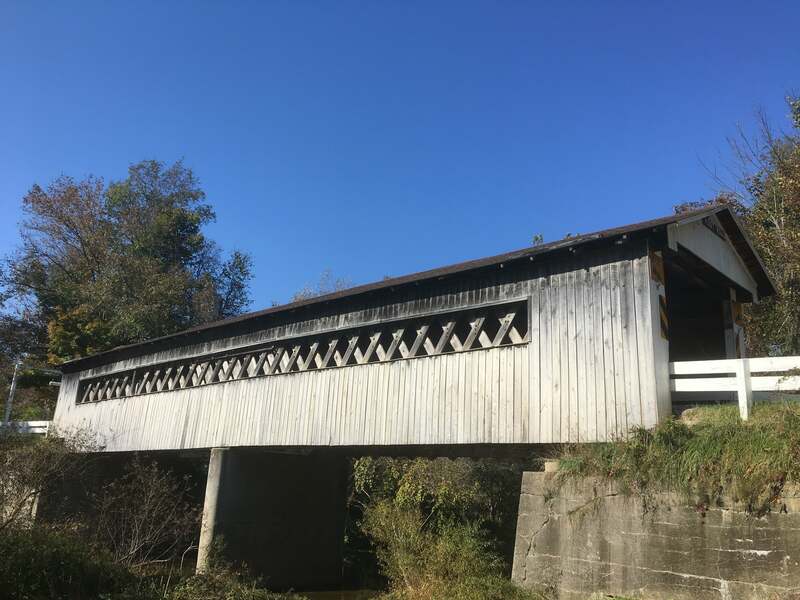 It is of Pratt truss, like Smolen Gulf Bridge, and was designed by Smolen Engineering. It sits below Smolen Bridge in Indian Trails Park. It was dedicated on Oct 4th, 2016. A 94-foot long Town lattice bridge built in 1868. Doyle spans Mill Creek. Mill Creek is a tributary of the Grand River. This bridge was renovated in 1987 when a laminated arch was added. Liberty Street Bridge is located on West Liberty Street just west of Rt. 534 in Geneva. It's 18' span carries traffic across Cowles Creek. 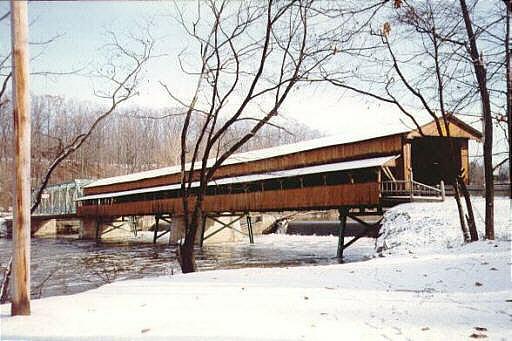 Completed in 2011 it became known as Liberty Bridge and it is the shortest covered bridge open to traffic in the US. 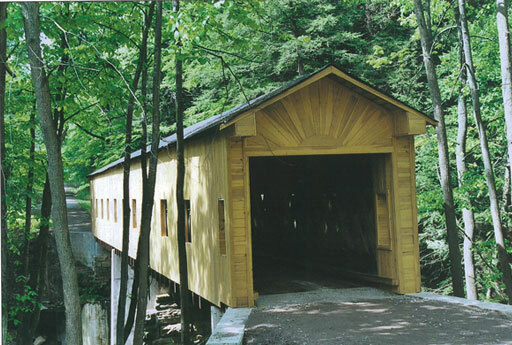 It was constructed by the A-Tech school who also constructed a small toll booth similar to what covered bridges had during pioneer days. 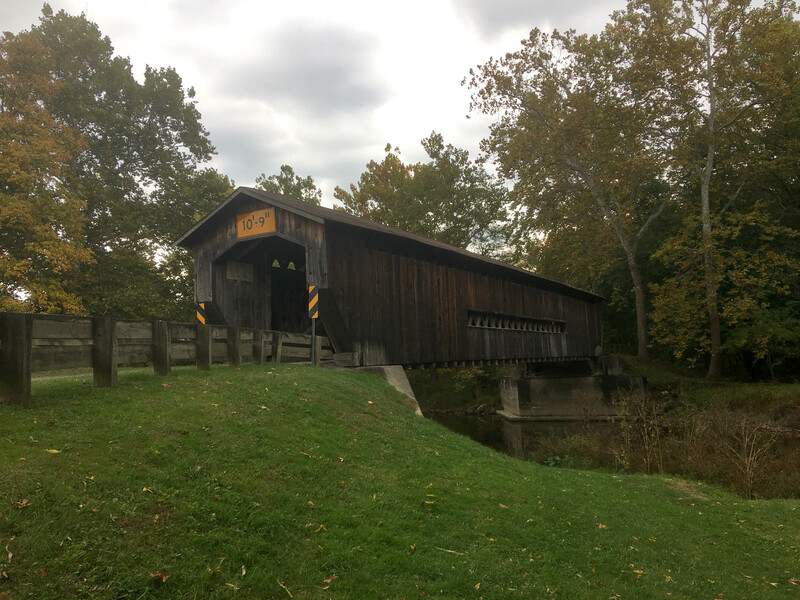 This two-span Howe truss bridge is 228-feet long, use to be the longest covered bridge in Ohio. It spans the Grand River, which is the primary drainage channel of western Ashtabula County. 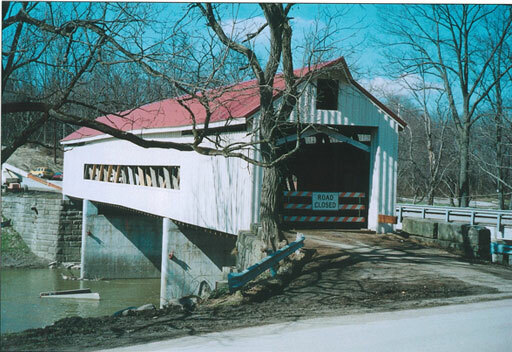 The bridge was built in 1868 and is listed in the National Register of Historic Places. Located in the County Metro Park it is a great place to picnic. A flood in 1913 washed soil away from the north end of the bridge and changed the river channel. The steel bridge was then attached. A walkway was added in 1991-92 when the bridge was renovated. 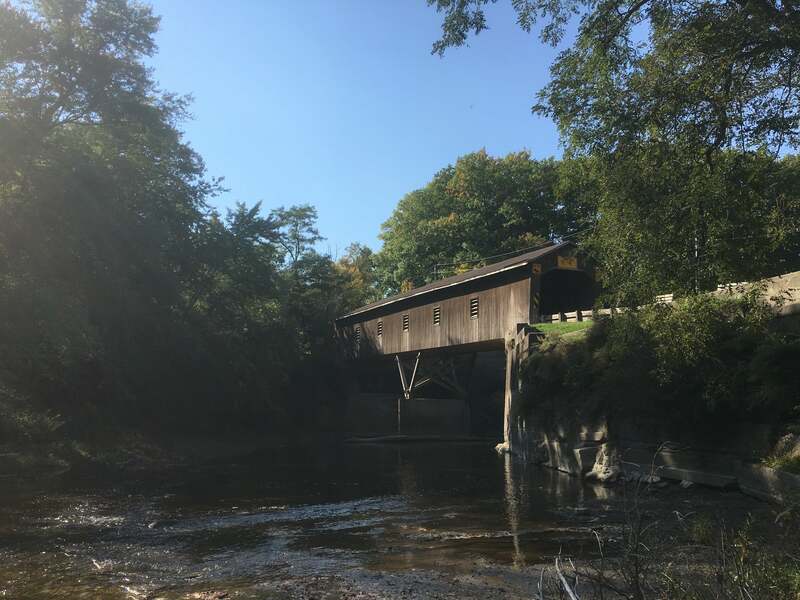 The second longest single-span Covered Bridge in Ashtabula County, this 156 ft. Howe truss with arch was built over Grand River in 1867. The arch is 15 layers of 2 x 8 lumber encased by large beams which form the X's of the Howe truss. 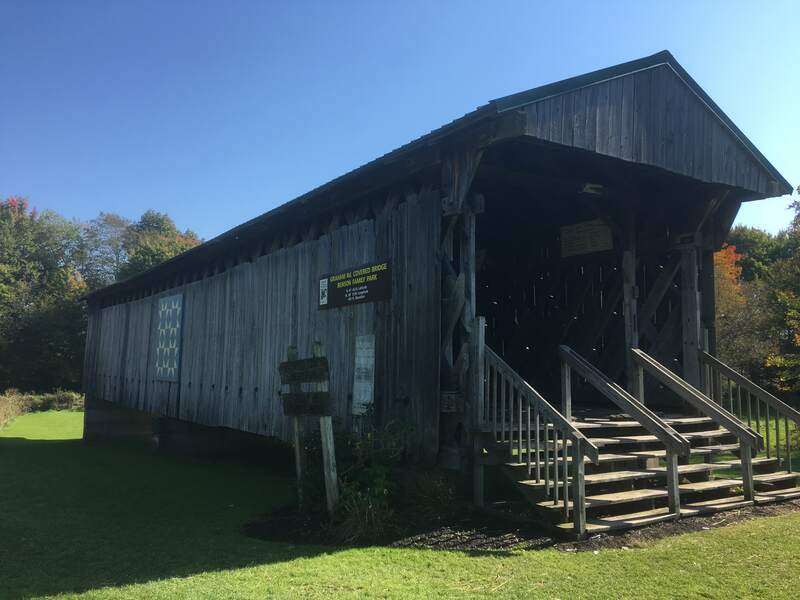 Believed to be the oldest of the County's covered bridges. This bridge was renovated in 2003-2004 and was once again opened to traffic in the spring of 2004.